In the insects’ world, the Japanese Giant Hornet (Vespa mandarinia japonica) is a real beast. It is one of the subspecies of the Asian Giant Hornet (Vespa mandarinia), which is the world’s largest hornet. As its name suggests, it is endemic to the Japanese islands, where it prefers rural areas where it can find trees to nest in. A single Japanese giant hornet can kill up to forty European honeybees a minute. So, a few of them can decimate an entire colony containing 30,000 bees. Compared to honeybees, it is a really giant: adults can be more than 4.5 centimeters (1.8 in) long, with a wingspan greater than 6 centimeters (2.4 in). It also has scissor-like teeth which can wreak havoc on its prey. 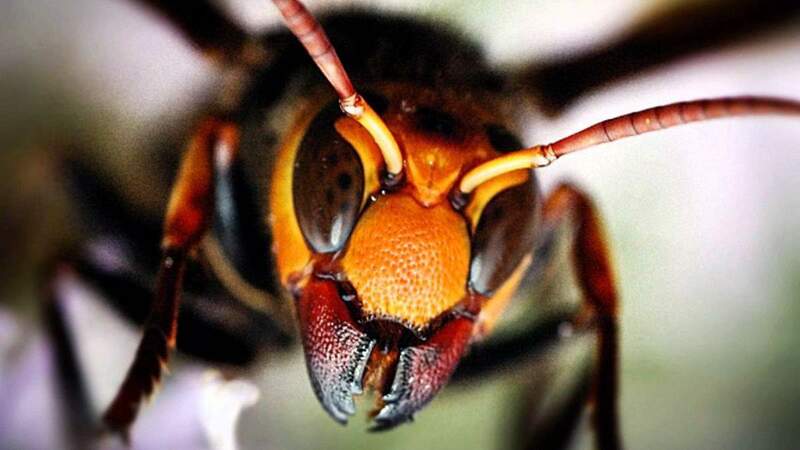 Japanese giant hornet has scissor-like teeth which can wreak havoc on its prey. Once a Japanese giant hornet has located a hive of European honeybees it leaves pheromone markers around it that quickly attract nest-mates to converge on the hive. And the massacre begins. European honeybees are more productive than the endemic Japanese honey bees. Because of that, In Japan, beekeepers often prefer European honeybees. But it is quite difficult to maintain a captive hive of European honeybees, as mentioned above. However, the Japanese honeybee (Apis cerana japonica) has a defense against these attacks. When a hornet approaches the hive to release pheromones, the bee workers will retreat back to the hive, leaving an opening to allow the hornet scout to enter. At a given point, the bees emerge from their hiding places in an angry cloud formation containing some 500 individuals. They form a tight ball around the hornet that acts like a convection oven when the bees vibrate their wings to direct air over their bodies, warmed by their muscular exertion, into the inside of the ball. The interior temperature of the ball rises to 47 °C (117 °F). The hornet can survive maximum temperatures of 44–46 °C (111–115 °F), but the bees can survive up to 48–50 °C (118–122 °F), so the hornet is killed and the bees survive. It was found that the hornet can survive temperatures of up to 47°C, and temperature alone is not sufficient in killing the hornet via bee ball. The combined carbon dioxide concentrations increasing inside the bee ball coupled with the temperature increase causes the hornet to expire. The ability to withstand heat for the hornet decreases as carbon dioxide concentrations increase. The amazing three minute video below, shows how the Japanese honeybees can kill a Japanese Giant Hornet forming a ball. Japanese honeybees raise their body temperature to cook an invading Japanese giant hornet. Once a Japanese giant hornet has located a hive of European honeybees it leaves pheromone markers around it that quickly attract nest-mates to converge on the hive. And the massacre begins. In the video above, only 30 Japanese giant hornets kill 30,000 European honeybees. A National Geographic documentary named “Hornets from hell”. This clip shows the Japanese giant hornets wiping out a honeybee hive. The latter part of the clip shows the bees’ payback.